01 Feb 2019 / 11:25 H.
Screenshot of Kyle leaping out of a helicopter and onto the helipad of the Burj al Arab in Dubai. 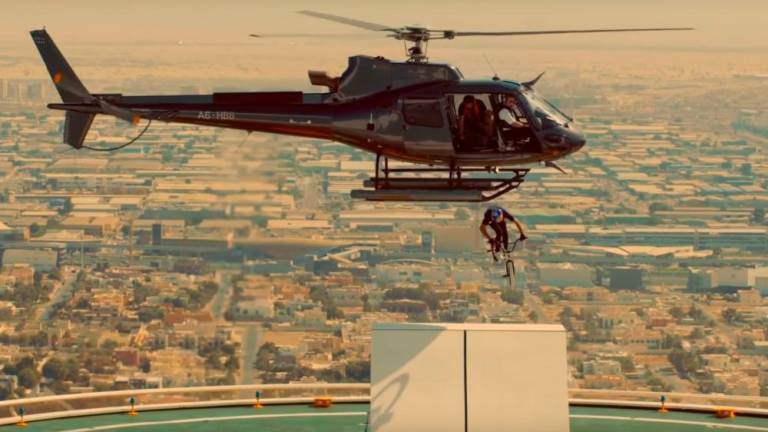 SCOTTISH BMX biker Kriss Kyle took his courage to dizzying new heights this week as he faced his fears and leaped out of a helicopter and onto the helipad of the iconic Burj al Arab hotel on Dubai’s coast recently. Kyle said he had to face his fear of heights for the jump and knew he couldn’t take too long as the chopper set itself up above a ramp on the helipad for a number of reasons. The biker jumped 14ft (4.2m) from the chopper and onto a 12ft ramp before another 30ft (9m) drop onto the red carpet that led him into the hotel.